A great one for video. Everybody will this film -- even if they think they won't. R-rated for language -- part of the rough-and-tumble world Billy lives in -- but otherwise great for kids, too. The backdrop for "Billy Elliot" is familiar: A haggard blue-collar English community, struggling under the conservative, anti-labor regime of Margaret Thatcher. We've seen variations on this theme in "Among Giants," "Brassed Off," "The Full Monty" and "The Van." The time period is specific -- it's 1984 and the coal workers are on strike -- although such details won't mean much to audiences outside Britain. But the characters and their drives and dreams are utterly unique in this non-pandering feel-good film that features such strong performances and original circumstances that even the most stalwart cynic will likely succumb to its charismatic charm. Newcomer Jamie Bell stars as Billy, the skinny but scrappy 11-year-old son of a callus, sometimes anguished mineworker (Gary Lewis). Dad sends him off to boxing lessons every day after school, but the sport doesn't seem to be Billy's forte. He's a tough little bloke, but he's awkward in the ring. However, when the boxing hall is forced to rent out one end of its gymnasium for a make-shift ballet class, the boy becomes curious -- then enthralled -- by the beauty and precision of this ostensibly feminine performing art. One day he steps up to the barre with the girls in tutus -- still wearing his boxing gloves and sweaty tank top -- and begins to plié. Before long he's hiding a new hobby from his roughneck pop and macho brother. It sounds silly, I know. But here's what makes the difference: Billy is the kind of kid who would give you a black eye if you teased him about learning ballet. His eyes burn with tenacity and struggling-class rage. He's got a quick temper and huge chip on his shoulder. He's not afraid to go nose-to-nose with his ill-tempered father or anyone else. Young Bell -- a dancer since he was 6 -- is outstanding in the role, giving Billy a childhood charm (the film opens with him jumping on his bed) and a great passion for his dance endeavor. Yet he leaves no doubt as to this kid's masculinity even though his puberty is still at the starting gate. His fervent footwork emerges from anger and frustration. It's not (yet) graceful because he's too butch to be naturally adept at it. 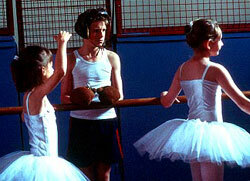 Ballet isn't an art to Billy -- it's a challenge. It's something to conquer. Director Stephen Daldry (a stage veteran making his film debut) does a superb job of depicting this as Billy's warmly acerbic, chain-smoking dance teacher (the inimitable Julie Walters) tutors him toward a possible royal academy audition. He also makes the film well rounded with astute emotional moments and allusions to the political atmosphere of the day. In an early scene, Billy tends his mother's grave in the shadow of factory smokestacks. Later he develops a cheeky but innocent flirtation with the dance instructor's brassy daughter. She's a worldly little girl who calls her mom "sexually unfulfilled." They walk to school together, dragging sticks along a brick wall, then across the plexiglas shields of the riot policemen gathered on the streets to quell any flare-ups by the town's striking miners. Such moments speak volumes about Billy Elliot's bleak world without awkward pauses for backstory about the boy's family or expository dialogue regarding the tension that gripped the U.K. during this period's labor disputes. The resourceful Daldry has other cinematic tricks up his sleeve and a mirthful, incidental sense of humor to boot. As Billy's ballet improves, his dance becomes an expression of his personality, leading to perfectly integrated dance scenes (not production numbers) that serve the story as naturally as dialogue -- like when Billy's beet-faced father finally discovers him rehearsing for his audition. The boy walks right up to him and breaks into a jig so furious he might as well be yelling in the face of his old man's angry disapproval. Another nice touch of authenticity: When Billy does get the audition -- after much ado about how such schooling might be financed if his abashed father were to acquiesce -- his ears turn bright red as he soft-shoes for a stuffy committee of judges. Such is Daldry's attention to character detail. In the last act, "Billy Elliot" succumbs somewhat to its inborn mushiness, especially when Billy bonds with his ambiguously gay best friend, elbowed into the story to forcibly demonstrate the hero's open-mindedness. But the strength of Bell's tempestuous performance carries the picture through any and all manipulative moments. This kid is such a wonder that even if "Billy Elliot" wasn't a total delight, it would still be worth seeing just to watch him.